Okay, here's the truth: I hate being on a schedule. Like.....A LOT. One of the biggest perks of being a SAHM for the last nearly 7 years is that I haven't really had to be on one. I let my babies sort of on-demand tell me when they were ready to eat, ready to sleep, wanted to play, etc - their little bodies mostly ran the show as we sort of naturally know what we need and when we need it. It got a little complicated as more kids and their little demanding bodies came along, but this really worked for us. Sure, we had the occasional gym class, playdate, and eventually preschool, but these were just little pieces of the 168 hours we spent together each week. It was kind of nice to have markers in our weeks, amid going with the flow. The older my kids grew, and the longer their school days became, going with the flow worked less and less. They gain more interest in sports and activities, make friends, get invited to parties, and our days suddenly require more structure to make everything fit. I've also noticed that Lukas, more than the other two, thrives on a schedule. And not wanting Summer to become one long strain of pj's and video games, I decided to create a flexible routine that I can live with. Depending on plans and weather, we can easily rearrange our days to work, but for the days we have nothing pressing going on? This suits us really well! Some days, it's really hard for the big boys to wait all the way until 1 or 2pm before they can play video games and watch videos (I have a hack for that I'll share another time! ), so I get a little lax and make deals with them. Sometimes I'll split their chores into pieces, or move outside time to lunch and we'll picnic. As long as they know that the days start and end the same, and that each of these pieces happen every day, we're successful. Some of these steps will mean different things to each family, but that's part of the flexibility that I love! For example, our Morning Routine includes eating breakfast, making their bed, and getting dressed, but sometimes we'll go outside in pj's so they can get dirty, and we'll get dressed afterwards (which keeps me from having extra laundry to do!). School time isn't for everyone, either, but as I mentioned recently, Luke's school assigns a lot of Summer work, and we need daily practice to get through it all. Chore time is nice, because not only are they helping me put the house together and learning how to do these tasks well, it creates time for me to do MY chores without having to worry about what trouble they're getting into while I struggle to load the dishwasher. Also? In an attempt to hold the accountable and also get practice with money, they earn nickles for each of their tasks and chores. They add up all morning, and then they can exchange them for video games and video time. Sometimes they get frustrated with it, and sometimes I give them freebie days where they don't have to earn their nickels first, but for a day when their attitudes are screaming for structure? This works really well! 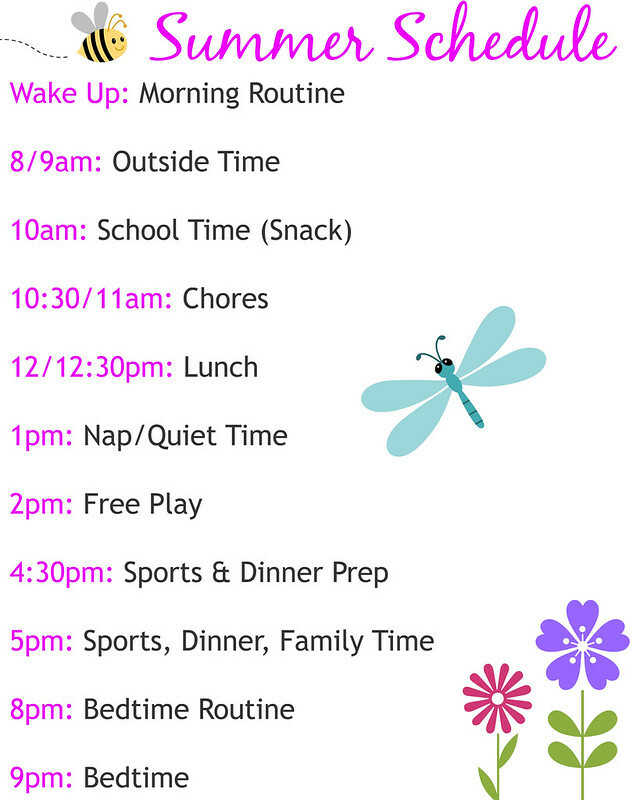 Do you keep your family on a Summer schedule? What helps you succeed day to day with your kids?